Over the summer I saw a few posts about upper grade teachers using calendar math. This was not the sit on the floor, use a pointer, and bundle up sticks kind of daily calendar that is typical in primary classrooms. 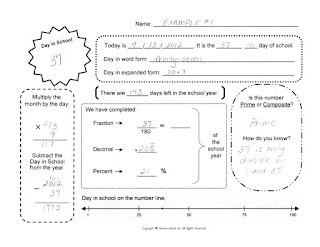 I really liked the idea of not having to create numbers for the students to use, and I loved that using the numbers in the calendar would lead to students being able to see patterns in math. 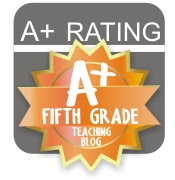 This year not only marked my return to 5th grade, but it was also returning to teaching math after several years of being departmentalized in 6th grade. To top it off I would be teaching the intervention math group. I was excited and apprehensive, but my calendar math fits in perfectly! In my intervention class I am blessed to have an hour of support from the resource teacher and a para educator. These wonderful ladies come in Tuesday-Thursday and we do an 18 minute rotation between our three groups. 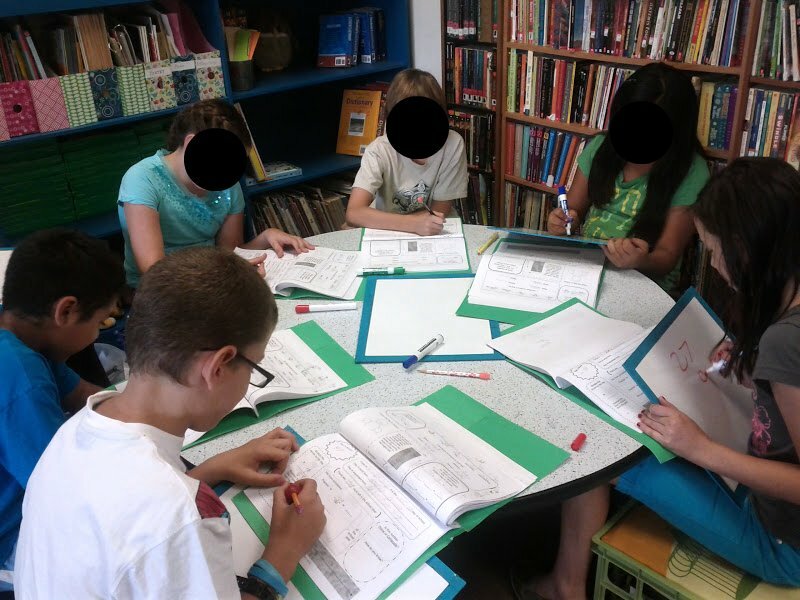 Because we were able to keep the class small our groups have only 6 students in each. 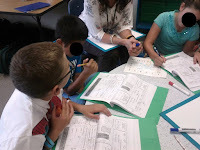 The resource teacher works with her group on the Lindamood-Bell program "On Cloud Nine." 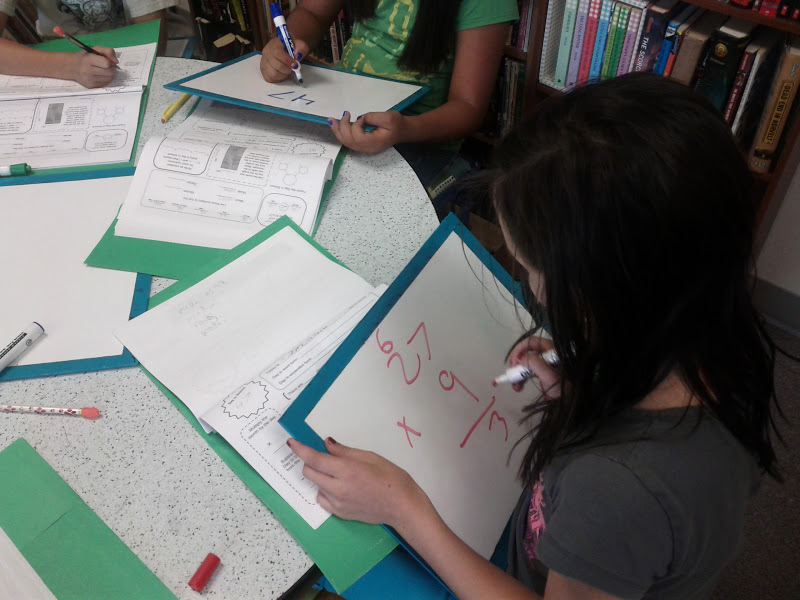 It is a wonderful program to help students gain the number sense they struggle with through visualization. In my group I work with the students on whatever concept we are covering. 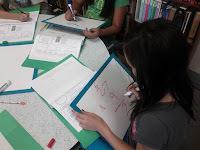 Sometimes I am introducing a new topic, providing extra practice, or we are playing a related math game. The para is the lucky Calendar Math guru! She sits with her group and sometimes they work through it together, or she lets them work on it on their own and supports them and checks their work as they go. At first the students were not coming close to finishing even one side of the worksheet during the 18 minutes in that center. I was ok with this, I knew that as they practiced, they would get better at it. And I was right! By the end of first quarter I had many students excited that they were finally able to finish the page! To freshen things up I made a second page for second quarter. Some of the concepts remained the same, and others that they knew well I switched out for new concepts. Now they are working their way back to being able to complete the entire thing in 18 minutes. For the first part of the year the students each had a folder filled with blank Calendar Math pages and they would work on one each of the three math intervention days. I've come to realize that this is taking up a lot of paper (and our principal wants to cut down), so I think I am going to laminate them so they can be reused each day. It seems to be effective so far and the para often tells me how the students are becoming better and more confident each day. 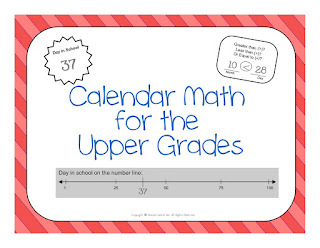 Interested in trying out my Calendar Math for Upper Grades with your upper grade students? You are in luck! Teachers Pay Teachers is throwing a HUGE Cyber Monday + Tuesday sale. I'm discounting every item by 20% and if you use the code CMT12 you'll get an additional 10% off. That's a huge 28% discount! Monday the 26th and Tuesday the 27th will be a great day to buy from the many talented teachers who have created outstanding resources! Think of it as a little holiday treat for yourself and your kiddos! If you have already purchased this item, THANK YOU! If you provided feedback on this item, another THANK YOU! You are now able to download the updated version of this item. Enjoy! I hope everyone is having a lovely time with their family and friends this weekend. My husband and I had a nice early meal at my mother-in-law's and I'll be spending the rest of the weekend getting caught up on writing my novel! Only 9 more writing days left of NaNoWriMo 2012. I love your blog! I’ve been following it for a while now and decided to nominate it for the Liebster Award. Head over to my blog to see what that entails!